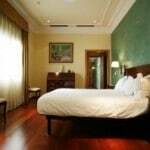 Hotel Montecarlo is a very popular hotel among tourists in Barcelona, and it has received a whole lot of great reviews from satisfied visitors on different hotel portals around on the internet. Hotel Montecarlo has four stars and it is located in La Rambla, which means in the heart of Barcelonas nightlife, shopping life and attractions. Even though Hotel Montecarlo is in the centre, the rooms are quiet and the hotel offer free wireless internet to its guests.